Will Mush change the way mothers socialise? They say after pregnancy making friends is easier but it’s not the truth in the first few months. A lot of your friends from your previous life, leave, it’s unfortunate but it’s true, so most of the time, unless you have a solid unit that don’t leave you, you spend a lot of time on your on. It’s a fact. Your partners have to go to work and most of the time they’re out all day, and even though there are lots of promises for groups you and your baby can go to, there are actually only a few and those that are available have limited spaces or cost an arm and a leg. Hopefully when Emily turns 6 months old and summer starts showing it’s happy face, going to groups and meeting other friends and new mums will be a little easier. Even when I go back to work, who knows how socialising will pan out, as I work from home, in the social media industry, I won’t be going back into an office, but that’s my choice so I can spend more time with Emily. I’m lucky that since I’ve moved here that I have already made a great friend in my bestie Emma. She’s been my lifesaver, my shoulder, my laughter and a great support here away from my family in a new town and same for her, whilst her family is back in London or in Ireland. Then I heard about a new app, an app called Mush. Mush promises to connect you with other mum’s in your area with babies/children similar to your age. It’s been described as “Tinder for Mums” and been a subject of discussion across social media, the press, TV and friends for a while and because of this,it’s just been a thought on my mind whether it will be any good. I don’t mean to doubt it, but with experience using app’s such as MummySocial, I have reason to doubt it. Mummy Social wasn’t a bad app, the message was there, the aim was there somewhere too, it was the fact that mums would message but were ‘too busy’ to meet others and that’s fine. But who knows whether they were too busy or just too shy to meet people beyond their safety net- their computer/mobile phone. 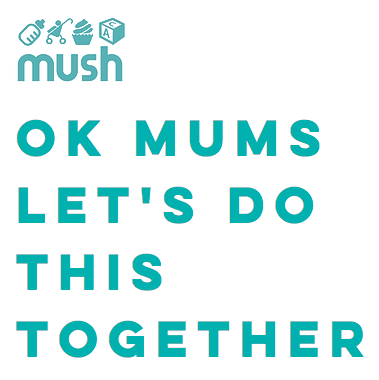 Mush founders Katie and Sarah had their children at different times and both had the same struggles as the millions of other mums in the UK and worldwide. They met in the playground one afternoon, made small talk, exchanged digits and came up with an idea that appeals to so many others. The app is free to install, available on iOS and Android and really easy to set up, you enter the details on your kid(s), ages and gender. From there the app asks you for your home location, DOB, a little profile blurb, what you like to do (I said “chatting,” “baking,” “reading” and “walking”) and to pick keywords that describe you, I chose “blogger,” “new to the area,” “wine lover” and “work from home.” Mush will use this information, the keywords and some sort of keyword searching (similar to that of a search engine) to find mums similar to you and your matching interests. Then it’s all down to you to press the “Say Hi” button and getting the show on the road. I sent one girl a message and she asked if I was on Facebook, we met for tea last Friday, she’s lovely. Some give us mum’s who are trying to make friends a bad rep by not really bothering to make an effort to make friends -expecting me to do the leg work and give you 1-word answers back. I give up! I always loved having my own space when I was single and younger, but being a new mother, finding time in between Emily’s naps to grab a blissful cup of tea and a chocolate brownie, or just 5 minutes to gather my thoughts can be difficult, especially now that Emily wants to put everything into her mouth and has figured out how to turn herself around 360 degrees and rollover. I love having our time but I also thinks it’s really important to make new friends for Emily’s sake as well as mine. I’m still relatively new to Ramsgate, it will be a year on the 5th June but I still think it’s important that new mums can feel they can socialise without their confidence being in the way ans hopefully this app can help with that. Hopefully something great comes out of this and more mums step out from behind their laptops and phones and meet up. Have you had a good experience with Mush?